Former Urban Pear sous chef, back when Ben Baird was in charge, Cody Starr named his new place in honour of his grandfather and has created in a former pizzeria on Adeline Street, an intimate, old world space with homespun charm. I took the Rex for a lunch time spin six months ago, when it was pretty brand new. That was back when the noon crowd — Rex is close to the Rochester office towers — was the focus of the kitchen. Evening-opening was in the thinking-through process. And now the dinner gong sounds, but only on Friday and Saturday nights. On our Friday night, the place was packed. Rex offers a limited dinner menu, which is always a pleasure for those of us decisioned-out by end of week. There is some choice — between two starters on our night (Cobb salad or crab cakes) and two mains (trout or brisket) for the set price of $35. Nothing rocked our world, but it was all pretty solid. If I had a quibble, it would have less to do with the quality of the food or the mix of flavours and more about portion and presentation. 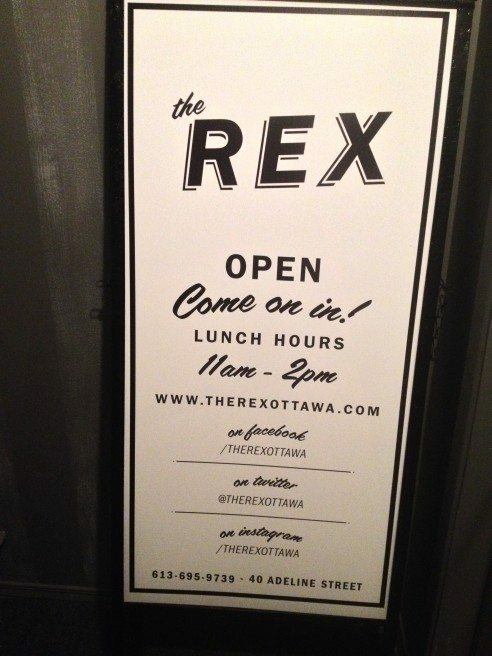 The Rex dinners seem to be trying on a simple, family style, come-as-ye-be sort of vibe. So modern, composed plates don’t feel quite right. The Cobb salad featured eggs, still soft at their yellow core, crisp lardons, a bit of Boston lettuce, avocado, tomato, and a sharp dressing, but the poster child for composed salads could have had a few more elements and been a bit more generous. 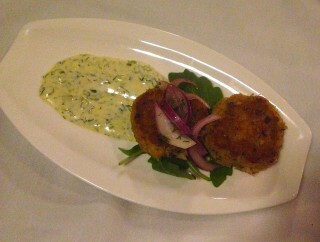 The crab cakes were meaty, well seasoned, served on a few greens with a dill remoulade and pickled red onion. Other than the odd choice of plate and fork (rather than bowl and spoon) to serve the fish and clam chowder, this was a lovely dish. It was just a bit tricky to eat. The cooking of the trout was well judged and the chowder starred three meaty Quahogs, steamed to just-open, with traditional mates of corn, carrots, celery, and soft leek and with crispy rings of leek for pleasing chew, in a rich cream sauce perfumed with clam juice, fresh thyme and anointed with leek oil. The second main was the ultimate Sunday supper comfort food — brined spiced brisket, slow braised to fork tender, with a sturdy caramelized edge, served with roasted carrots and brussels sprouts, and with horseradish spiked mashed potatoes. A whole grain mustard sauce finished things with an extra little zing. For dessert, the Johnny Cakes combined a cornmeal pancake with ice cream and rhubarb-maple compote and the Boston cream pie — dark shiny chocolate sauce, solid cake, well flavoured pastry cream, bittersweet caramel sauce — gets full marks. Three course table d’hôte, $35 on our night. 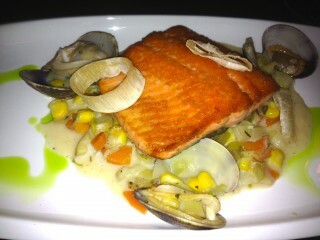 Open Monday to Friday for lunch, Friday and Saturday for dinner.